Welcome to the Ren'Py quickstart manual. The purpose of this manual is to demonstrate how you can make a Ren'Py game from scratch in a few easy steps. We'll do this by showing how to make a simple game, The Question. Getting Started. 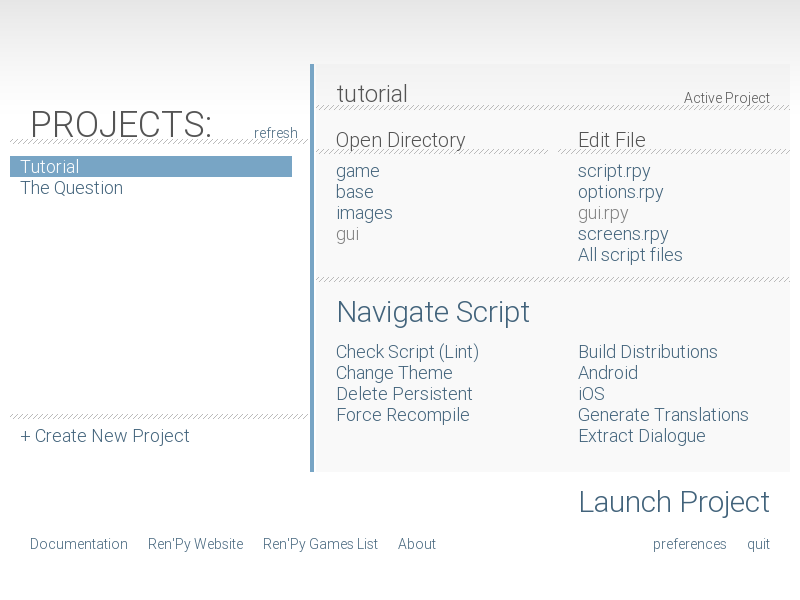 To get started you'll want to download Ren'Py. Once you've downloaded Ren'Py, you'll want to extract and run it. On Mac OS X, double-click on the downloaded drive image to mount it as a drive. When the drive opens, copy the folder named renpy-<version> somewhere else. (Where does not matter, but it has to be moved out of the read-only drive image. Do not move the renpy app out of the folder it's in – it won't work elsewhere.) Then change into it, and run the renpy application. On Linux, unpack the tarball, change into the renpy-<version> directory, and then run renpy.sh. After running this, the Ren'Py launcher should run. The Ren'Py launcher has been translated to multiple languages. To change the language, choose "preferences" at the bottom right, and then select the language. Choosing and Launching a Project. You should first see what the completed The Question game looks like. To do this, start the Ren'Py launcher, and choose "The Question" from the first screen. Choose "Launch Project" to start The Question. You can get back to the Ren'Py demo by doing the same thing, but choosing "Tutorial" instead of "The Question". The main screen of the Ren'Py launcher. Selecting the accent and background colors for the default theme. Creating a new Project. Create a new project by choosing "Create New Project" from the launcher. 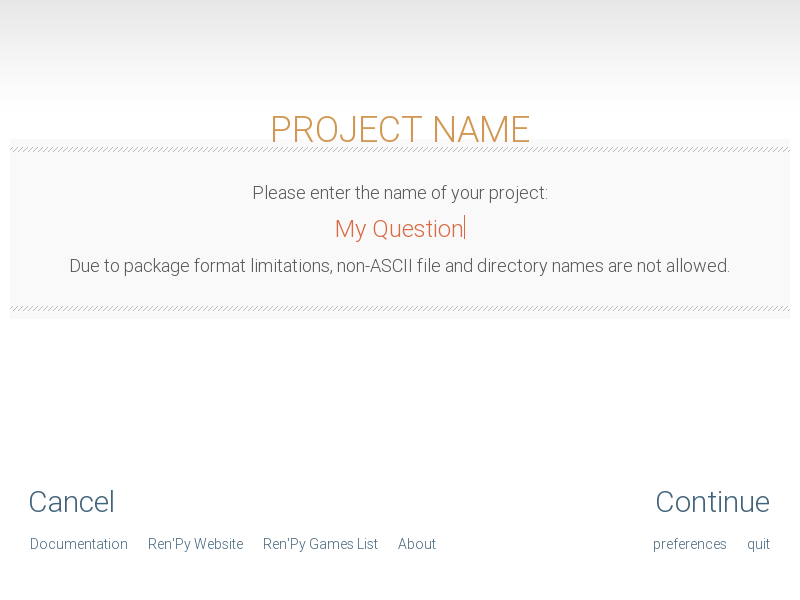 If this is your first time creating a project, Ren'Py may ask you to select the projects directory. This is a directory (also called a folder) where new projects are created, and is scanned for existing projects. The directory chooser might pop up below Ren'Py, so be sure to look for it there. The launcher will then ask you for a project name. Since "The Question" is already taken, you should enter something different, like "My Question", and type enter. After that, the launcher will ask you to select the project resolution. The default of 1280x720 is a good compromise between game size and image quality. For the purpose of this tutorial, we will select 1280x720 to match "The Question" game art, then click "Continue". 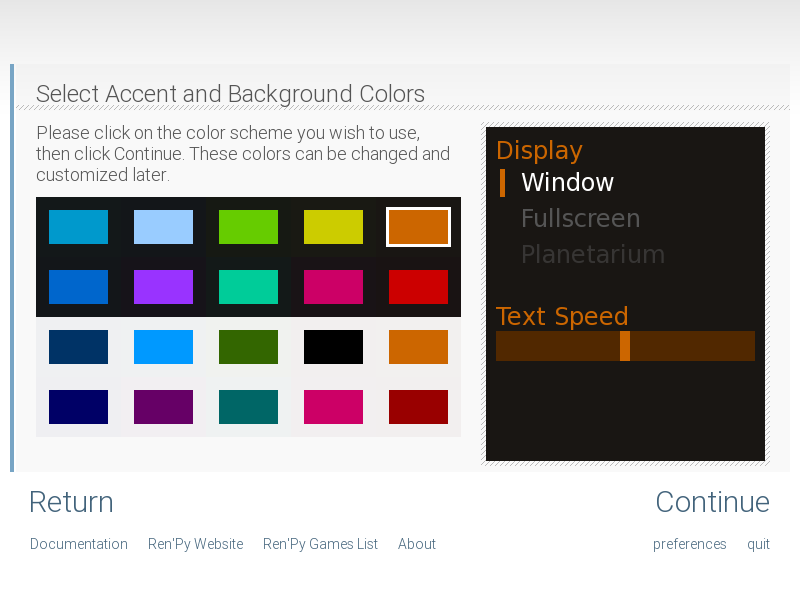 The launcher will then ask you to choose a color scheme – an accent and background color for the new GUI. It doesn't matter what you pick at this point, so just pick something you find appealing, and then click "Continue". At this point, Ren'Py will process for a bit, and spit out a simple game template. The template used placeholder art and text, but is runnable, and supports expected features like rollback, loading, and saving. Choose "Launch Project" to run it. This is a very simple Ren'Py game. It doesn't include any pictures or music, but it does show a conversation between two characters, and a line of narration. To try this out, from the top screen of the launcher select "My Question" project, and then choose "script.rpy" from under Edit File. If this is your first time, Ren'Py will ask you to select an editor (we recommend Editra for first time creators), and will download the editor you choose. Then it will open the script file in the editor. Once the editor opens, erase everything in script.rpy. We're starting from scratch, so you don't need what's there. Copy the example above into script.ry, and save it. You're now ready to run this example. Go back to the launcher, and choose "Launch Project". Ren'Py will start up. Notice how, without any extra work, Ren'Py has given you menus that let you load and save the game, and change various preferences. When ready, click "Launch Project", and play through this example game. The first line is a label statement. The label statement is used to give a name to a place in the program. In this case, we create a label named start. The start label is special, as it's where Ren'Py scripts begin running when the user clicks "Start Game" on the main menu. While this simple game isn't much to look at, it's an example of how easy it is to get something working in Ren'Py. We'll add the pictures in a little bit, but first, let's see how to define characters. One problem with the first example is that it requires you to repeatedly type the name of a character each time they speak. In a dialogue-heavy game, this might be a lot of typing. Also, both character names are displayed in the same way, in the accent color selected when starting the game. To fix this, Ren'Py lets you define characters in advance. This lets you associate a short name with a character, and to change the color of the character's name. We've also changed the say statements to use character objects instead of a character name string. This tells Ren'Py to use the characters we defined. A visual novel isn't much of a visual novel without pictures. Here's another scene from "The Question". This also includes statements that show images to the player. This can fully replace the previous section of script, if you want to try it out. This segment of script introduces two new statements. The scene statement on line 6 clears all images and displays a background image. The show statements on lines 16 and 26 display a sprite on top of the background, and change the displaying sprite, respectively. In the scene statement on line 6, the tag is "bg", and the attribute is "meadow." By convention, background images should use the tag bg. In the first show statement on line 16, the tag is "sylvie", and the attributes are "green" and "smile". In the second show statement on line 26, the tage is "sylvie", and the attributes are "green" and "surprised". Only one image with a given tag can be shown at the same time. When a second image with the same tag is show, it replaces the first image, as happens on line 26. Ren'Py searches for image files in the images directory, which can be found by selecting "images" in the "Open Directory" section of the launcher. Ren'Py expects character art to be an PNG or WEBP file, while background art should be a JPG, JPEG, PNG, or WEBP file. The name of a file is very important – the extension is removed, the file name is forced to lowercase, and that's used as the image name. For example, the following files, placed in the images directory, define the following images. Since the filenames are lowercase, the following also holds. Images can be placed in subdirectories (subfolders) under the images directory. The directory name is ignored and only the filename is used to define the image name. The image statement is run at init time, before label start and the rest of the game script that interacts with the player. The image statement can also be used for more complex tasks, but that's discussed elsewhere. In the script above, pictures pop in and out instantaneously. Since changing location or having a character enter or leave a scene is important, Ren'Py supports transitions that allow effects to be applied when what is being shown changes. Transitions change what is displayed from what it was at the end of the last interaction (dialogue, menu, or transition – among other statements) to what it looks like after scene, show, and hide statements have run. Here, None is used to indicate a special transition that updates Ren'Py's idea of what the prior screen was, without actually showing anything to the player. To do this repositioning, add an at clause to a show statement. The at clause takes a position, and shows the image at that position. Ren'Py includes several predefined positions: left for the left side of the screen, right for the right side, center for centered horizontally (the default), and truecenter for centered horizontally and vertically. Creators can define their own positions, and event complicated moves, but that's outside of the scope of this quickstart. Most Ren'Py games play music in the background. Music is played with the play music statement. The play music statement takes a filename that is interpreted as an audio file to play. Audio filenames are interpreted relative to the game directory. Audio files should be in opus, ogg vorbis, or mp3 format. When changing music, one can supply a fadeout and a fadein clause, which are used to fade out the old music and fade in the new music. The queue music statement plays an audio file after the current file finishes playing. Sound effects can be played with the play sound statement. Unlike music, sound effects do not loop. The pause statement causes Ren'Py to pause until the mouse is clicked. If a number is given, the pause will end when that number of seconds have elapsed. This example shows how a menu can be used with Ren'Py. The menu statement introduces an in-game choice. It takes an indented block of lines, each consisting of a string followed by a colon. These are the menu choices that are presented to the player. Each menu choice takes its own indented block of lines, which is run when that menu choices is chosen. In this example, each of the two menu choices runs a single jump statement. The jump statement transfers control to the a label defined using the label statement. After a jump, script statements following the label are run. In the example above, after Sylvie asks her question, the player is presented with a menu containing two choices. If the player picked "It's a videogame. ", the first jump statement is run, and Ren'Py will jump to the game label. This will cause the POV character to say "It's a story with pictures and music. ", after which Ren'Py will jump to the marry label. If there is no jump statement at the end of the block associated with the label, Ren'Py will continue on to the next statement. The last jump statement here is technically unnecessary, but is included since it makes the flow of the game clearer. Labels may be defined in any file that is in the game directory, and ends with .rpy. The filename doesn't matter to Ren'Py, only the labels contained inside it. You can think of all the .rpy files as being equivalent to a single big .rpy file, with jumps used to transfer control. This gives you flexibility in how you organize the script of a larger game. While some games can be made by only using the statements given above, other games requires data to be stored and recalled later. For example, it might make sense for a game to remember a choice a player has made, return to a common section of the script, and act on the choice later. This is one of the reasons why Ren'Py has embedded Python support. Here, we'll show how to store a flag containing information about a choice the player has made. To initialize the flag, use the default statement, before label start. The book flag starts off initialized to the special value False (as with the rest of Ren'Py, capitalization matters), meaning that it is not set. If the book path is chosen, we can set it to True using a Python assignment statement. Lines beginning with a dollar-sign are interpreted as Python statements. The assignment statement here assigns a value to a variable. Ren'Py has support for other ways of including Python, such as a multi-line Python statement, that are discussed in other sections of this manual. If the condition is true, the block of script is run. If not, it is skipped. The if statement can also take an else clause, that introduced a block of script that is run if the condition is false. Python variables need not be simple True/False values. Variables can be used to store the player's name, a points score, or for any other purpose. Since Ren'Py includes the ability to use the full Python programming language, many things are possible. Check for a new version of Ren'Py. New versions of Ren'Py are released on a regular basis to fix bugs and add new features. Before releasing, you'll want to click update in the launcher to update Ren'Py to the latest version. You can also download new versions and view a list of changes at https://www.renpy.org/latest.html. Rarely, changes to Ren'Py will require you to make a change to your game's script. https://www.renpy.org/doc/html/incompatible.html has a list of these changes. From the front page of the launcher, choose "Check Script (Lint)". This will check your games for potential errors. Since some of these errors will only affect users on other platforms, it's important to understand and usually fix all errors, even if you don't see the problem on your computer. From the front page of the launcher, choose "Build Distributions". Based on the information contained in options.rpy, the launcher will build one or more archive files containing your game. Lint is not a substitute for thorough testing. It's your responsibility to check your game before it is released. Consider asking friends to help beta-test your game, as often a tester can find problems you can't. Once the game has been finished and tested, you should post the generated archive files on the web somewhere people can see them. (If you don't have your own website, https://itch.io hosts a lot of visual novels.) Congratulations, you've released your first visual novel! The Ren'Py Games List helps us keep track of Ren'Py games being made. The Completed Games section of the Lemma Soft Forums is a good place to tell fellow creators about your game. You can view the full script of ''The Question'' here. This Quickstart barely scratches the surface of what Ren'Py is capable of. For brevity's sake, we've omitted many features Ren'Py supports and simplified others – focusing on the minimum set of features used to make a visual novel. To get a feel for what Ren'Py is capable of, please play through the Tutorial, and perhaps some of the games featured on the Ren'Py website. You may also want to read the rest of this manual, starting with the GUI Customization Guide. Beyond that, we recommend checking out the Ren'Py section of the Lemma Soft Forums, which has a section for asking questions, and a cookbook section with libraries and examples meant for reuse. The Lemma Soft Forums are the central hub of the Ren'Py community, where we welcome new creators and the questions they bring. Thank you for choosing the Ren'Py visual novel engine. We look forward to seeing what you create with it!